The first four are American Burmese and represent each of the four accepted colors. Mango is European Burmese. They are beautiful wonderful cats. The following description is very true. Indeed Mango repeatedly plays "fetch" like a dog with a little stuffed mouse that he brings to you. Burmese are vocal like the Siamese but have softer, sweeter meows. They are people oriented, forming strong bonds with their owners, gravitating toward all human activity. 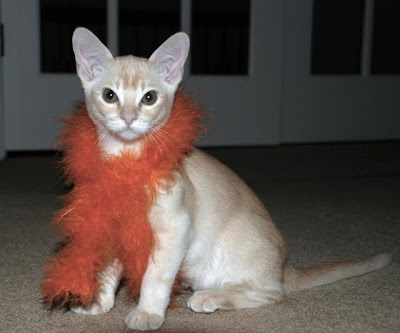 The Cat Fanciers' Association (CFA) breed information on the Burmese implies that all survival instinct of flight or fight seems to have been bred out of them. However, other sources note that, while rarely aggressive with humans, Burmese cats tend to be able to defend themselves quite well against other cats, even those larger than themselves. Burmese maintain kitten interests and energy throughout their adulthood and are very athletic and playful. In some instances they even retrieve items as part of a game. Sunday we got a call from housesitter that Nova is missing, apparently since Friday night. Emails to the neighbors indicate that he was seen Saturday at the end of the street. While I'm on the subject of cats, here are some pics of Mango, my favorite. Amanda likes to decorate the poor thing but he appears to like it.